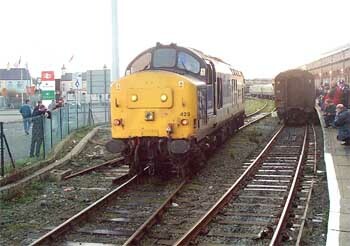 To those who have followed the performance of the Class 37/4 locomotives on the North Wales Coast, the 30th December 2000 must have seemed like the day that would never be, with so many false sunsets it seemed that the growlers would last forever. Sadly for us all that day did arrive and if there was ever any doubt about the popularity of these machines the loading on the last trains said it all. 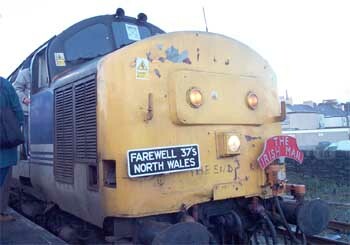 Indeed as 1D71 was preparing for the final departure to North Wales an announcement was made on the P.A. system which commenced with the words "Due to the nature of this train...." and basically advised "ordinary" passengers to detrain and cross to platform 9 where a Hippo would be pleased to transport them to Chester. Surely there has to be a marketing opportunity here for FNW or whoever. So, as these beasts bid farewell to North Wales an uncertain future awaits and although we may see the odd impromptu passenger appearance by a 37 West of Crewe, it can never be the same again as their successors progressively overcome their technological difficulties. Whether we will ever forget the distinctive tickover in the station confines or the aggressive yet intermittent roar as they took off and slipped a little perhaps, only the passing of time will tell. We all have photos and video footage but, as those of us who witnessed the passing of steam well know, all the images and specials in the world cannot ever replicate the service trains. 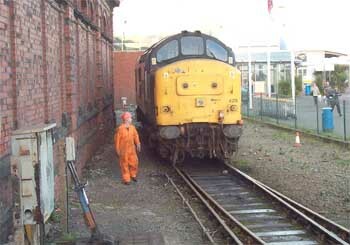 Shall I ever again witness the sight of a 37/4 trundling into view by the Crewe Heritage Centre as it cautiously picked its way through the tangle of lines and points to gain access to platform 12. Even this semi-derelict outpost of Crewe's heyday seemed to befit the sombre temperament that the final operational Winter brought. I rode the final Crewe - Birmingham - Holyhead - Crewe trains which brings its own difficulty because if you ride 'em you cannot photograph 'em. 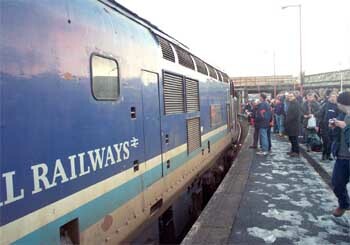 That the temperature at Crewe was minus seven meant little with most sliding top lights being left open for the whole journey and there was a discernible hush in the packed coach as the locomotive was opened up from each stop. Yes it's sentimental but if your blood is not stirred by the sound of a 37 at full bore then I believe you have no soul. I am pleased I was able to follow the progress of these machines albeit for only a short period and I am grateful to Charlie Hulme for his support and seemingly untiring efforts to keep us all informed via his North Wales Coast website. Arrival (it's a "Prisoner" thing!) 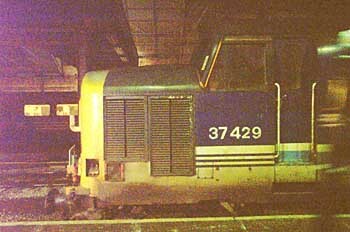 and 37429 "Eisteddfod Genedlaethol" has made it to the final day. Now looking the worse for wear and with an uncertain future, this stalwart of the North Wales Coast is the last member of the operational sub class to retain the "Regional Railways" livery. Sadly the "RR" coaches were not available to make up the full set but what the heck. 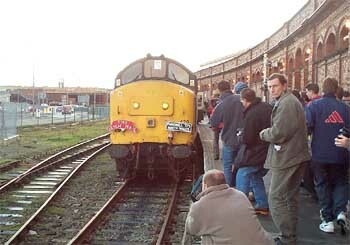 This shot shows the locomotive entering Crewe station with 1G96 the 7.49 from Holyhead already some 40 minutes down. Ambient temperature minus seven Celsius. 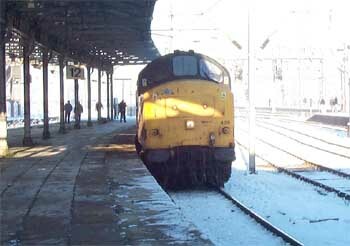 A spirited run in blinding sunshine but too much time had been lost and 1G96 was terminated at Wolverhampton. 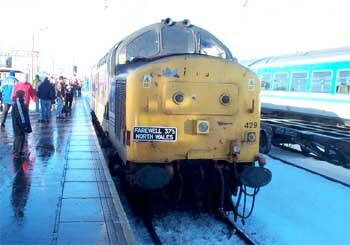 This shot shows 429 reversing onto the train to form 1D71 for Holyhead, the headboard was acquired at Crewe or Stafford because it was on the loco when it arrived at Wolverhampton. Unable to leave my seat for fear of loosing it, I took no more no pictures until we reached Holyhead. A quick sprint along the platform to beat the crowd but too late. By now 429 had gained an "Irish Mail" headboard, the sentiment was right but I'm not sure about the accuracy of such an attachment. 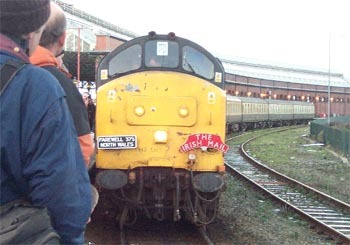 Still, it looked good and added to the sense of occasion as did the anti "Hippo" poster that had appeared in the windscreen of the loco. 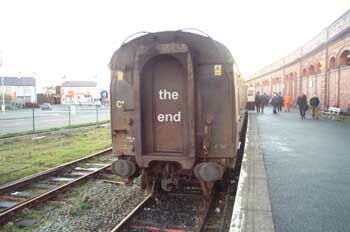 The runround has become routine yet interesting but now no more, an anachronism in this era of the multiple unit. 429 carefully crossed over on the creaking rails to head for the other end of its train and the final charge along the coast. The western end of the Holyhead platform narrows considerably which made it impossible to take any clear shots, usually photographers respect each others space but not today - survival of the fittest. The only way was to lean out, a dangerous practice at the best of times. There were two BTP officers on board from Rhyl and I commend their handling of the situation, there was no oppressive manner just a presence. They could have been officious but were not and I feel we owe them thanks for that. The other way was to shoot from where nobody else was standing but it was not so effective. Just one with the two headboards and the hand written question to which there is no answer just hopeful anticipation. 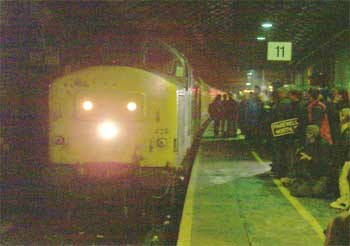 The night soon closed in on the occasion and arrival at Crewe was mayhem with the gloom of Crewe station preventing any decent shots with my digital camera so it is down to the PC to enhance as much as possible. 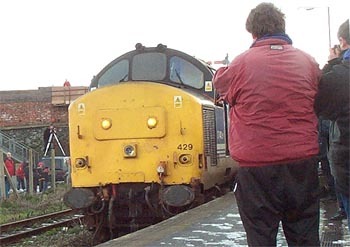 The crowd bayed for a last growl but the number of people on the platform edge prevented such a move and 429 took its bow in relative silence as it proceeded to the carriage sidings for the final time. With over 9000 hours on the clock, what chance survival?